When I picked the box up off the porch I heard a disturbing sound. Somewhat like broken pottery jiggling around. Boo. And this is what I found inside. Very little wrapping. One looked okay. But when I pulled the plastic tape off the lid, the paint came off. Now, on the very same day yet ANOTHER Bauer rose bowl arrived from a seller on eBay (I am a little obsessed with getting a set in white to decorate for parties). Now that is how you ship a ceramic! No way did I want to pay for postage back on three ceramic canisters in a giant box, so I dutifully complied with the instructions to return my order to a JCP store "... this is the quickest and easiest way to return merchandise." First I had to find a JCP and learned they are NOT conveniently located near my home. Then I had to take the giant son with to haul the hefty box into the store. After tromping up several escalators with said box, and waiting in a long line, we learned that we could only return home goods at a JCP Home Goods store (not mentioned in the return policy). Luckily, one was across the parking lot. Once in the store, we couldn't return the canisters at a regular counter, we had to take them to the "internet returns" desk. What a pain in the a _ _. Sorry JCP. That was my last online purchase from you, and I primarily shop online. To be fair, the Jonathan Adler stuff was really nice. The linens were awesome actually. I stuck to my guns and exited the store. We do love happy endings on this blog. My patience was rewarded. Found these little pretties at a Pier 1 Imports a week or so later. In person, no shipping and half the price. I may actually like them better. Kind of goes with the Australian Art Nouveau tile. Good grief, who in their right mind would ship something like that? You should get combat pay for trying to return it! Good grief is right. Totally mystified. 100% shipped out will arrived at their designation broken. For sure. 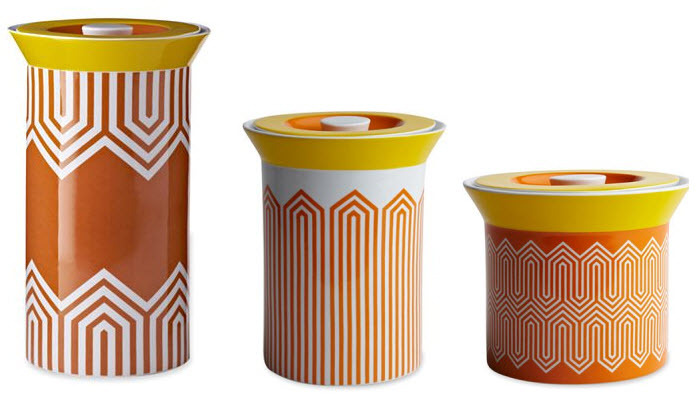 Jonathan Adler...and the paint peeled off? That's insane! I've see eBay sellers ship that poorly, but never a major company. Shame on them. So strange ... and not good. I had a similar experience purchasing Jonathan Adler items from yliving.com last holiday season. While JCP should be held accountable, even "high end" stores succumb to warehouse shipping issues. Good point. Is it Jonathan Adler or JCP? I would be gutted if something like that happened to me. Funny I have just been looking at the Crate and Barrel website...I wonder what their packaging's like? I had something like this happen with Pottery Barn many years ago. I ordered a chandelier and it kept coming bent and I kept returning it until it wasn't bent. Returned it twice. My husband admired (thought I was crazy) my persistence. I just desperately wanted this one, obviously cheap, chandelier. I once ordered a set of dishes online from Target, and when they arrived, several of the plates had broken during shipment. I called Target customer service and the rep told me NOT to return them. He said to just throw them away so I wouldn't be handling them any more than necessary and get hurt. They didn't even require any photos as proof of the brokenness; they just shipped out a new set right away. JCP should take a lesson from Target. Oh, I am sorry that you had to go through that. You must have been so disappointed when you opened the box and saw- not the pretty canisters you were expecting but broken ceramics. Why didn't they pay more attention to packaging. I'm hoping that was a rare case. Glad you had a happy ending.